The Original Fungi-Nail Toe and Foot Nail Solution is a good topical product that treats fungi on the nails, feet, and surrounding skin. The manufacturer claims that it works by forming a clear, water-resistant barrier that locks in the medicinal properties of this product to the affected area. This treatment contains only two ingredients – 25% Undecylenic Acid (active) and Isopropyl Palmitate (inactive). Undecylenic Acid is a naturally occurring chemical derived from castor oil that has antibacterial, antifungal, and antiviral properties. Because of this, it is a safe and effective way to treat nail fungus. Isopropyl Palmitate is an emollient, moisturizer, thickening and anti-static agent. Undecylenic is a harmless compound and generally does not produce side effects. However, we found some of the reviews that stated some users reported irritation, redness, and discoloration of the skin around the affected areas. This is a topical solution and should not be ingested. In case of accidental ingestion, contact a doctor or a poison control center. This product can be purchased, both online and in stores. Prices vary depending on the location, from $8.76 at Target for a 1 Fl. oz bottle to $17.99 at FootSmart for a 1.7 Fl. oz bottle. Is Original Fungi-Nail Worth Your Time? 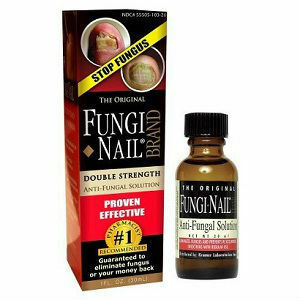 The Original Fungi-Nail Toe and Foot Nail Solution has a simple formula and is generally safe for use, all-natural, and highly effective. However, there are no product reviews to support these claims. Without any feedback, we could not be certain about the overall effectiveness of this product. There are so many products out there designed to eradicate athlete’s foot that we felt this product was lacking in terms of ingredients that it contained. We would liked to have seen more clinically proven ingredients and soothing herbal extracts for skin and nail regeneration, included in their formula. Plus, many manufacturers offer a clear money back guarantee should the product not work as expected, we could not find a comprehensive guarantee for this product, which is always a minus for us. Jack Stevens	reviewed The Original Fungi-Nail	on February 6th	 and gave it a rating of 3.5.